Our single sided Island Cubby Display is so versatile it can store and display a wide variety of products: Books, Bottles, T-shirts, Handbags and much more. 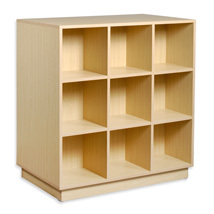 Each cubby measures 12 in. W x 11 1/2 in. D x 12 in. H. The single sided display has 9 cubbies. Great for schools & libraries too! Don`t forget to add sign holders to effectively advertise your specials, search item 4886.